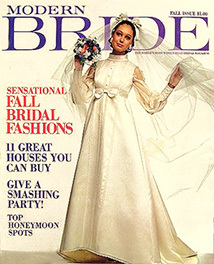 Modern Bride Fall 1970 issue featured an elegant satin wedding dress on the cover. The long sleeves and high collar provide a modest appearance for the bride. Large bow at the empire waistline and on the bridal veil headpiece invoke a childlike innocence.